I will feature boutique effect manufacturers regularly and I would like to start with Retroman. 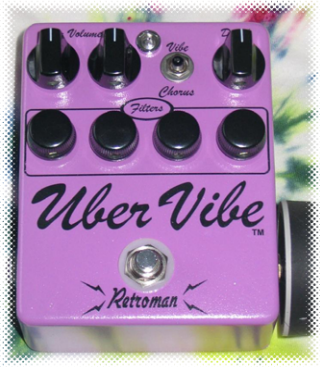 I found them while looking for a small footprint Univibe clone. A choice of distortion, fuzz, fuzz octave, and octave pedals: the sybil dual fuzz (silicone and germanium), the hi octone octave fuzz, the octavious octaver and several fuzz such as the nu fuzz, the scram, the lola, the wolf tone machine and the tone zilla. The sound samples speak for themselves: check out the uber vibe, the lola or the sybil. Be sure to check all the product pages for more samples! They ship everywhere in the world and prices are on par with other boutique manufacturers, pedals range from US$ 165 to around 300. Note that orders take 6 to 8 weeks at the moment.